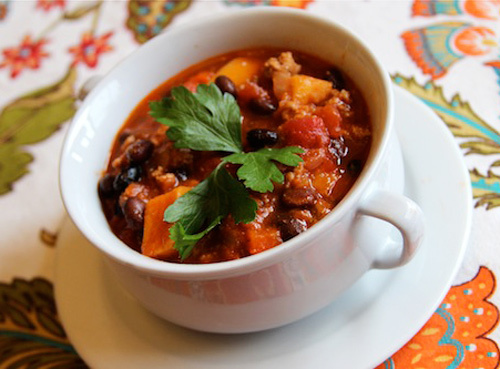 This is a great hearty and healthy chili recipe that is family friendly and perfect for those cool fall evenings. My children like to top theirs off with sour cream and a sprinkling of sharp cheddar cheese. As a special treat, they use a small handful of Frito scoops to spoon up the chili. I am okay with the small Fritos portion given that they are getting a nutritionally power packed chili and it makes it fun for them to eat. In the seasoning additions, we use Smoked Paprika – this is a very different taste than regular paprika and adds that smoky taste that is perfect for chili. In fact, when recipes call for paprika we ONLY use Smoked Paprika as it adds such depth. Some like their chili with a lot of pizazz – this is a family friendly chili so the addition of “zing” is used sparingly. Please adjust the seasonings according to your heat preference. Making this chili a day in advance will help to enhance the flavors even further. Using LEAN ground turkey instead of ground beef cuts back on calories and fat. Note: Not all ground turkey is created equal – choose a lean ground turkey package or choose ground turkey breast. Cooking the spices slightly helps to enhance the flavor and that gives a lower fat dish more flavor without additional fat. Great choice for cool fall evenings! Add the onions, peppers, carrots, squash and garlic, stir and cook until the vegetables are tender and the onions are translucent, about 8 minutes. Sprinkle the chili powder, cumin and smoked paprika over the top, stir and let the spices toast for a minute as this enhances their flavor. Add the turkey, and while cooking, stir the meat and break up the turkey well, until cooked through, about 5 minutes. Add the paste, beans, tomatoes and broth and bring to a simmer over medium heat. After the chili is brought to a near boil, reduce the heat and simmer uncovered until the liquid has reduced in the chili and it has thickened, about 1 hour. Adjust the seasonings according to your preference, serve and garnish with your favorite chili toppings.